Want an Old Fashioned? Just add ice. If you're home bar is a little scant, one company has a solution that involves using flavored ice to make just-add-liquor cocktails. It might be the easiest mixed drink you'll ever make (that is, if you want something a little more complex than a vodka Coke). Herb & Lou's ice cubes have all the flavoring already in them, so all you need to do is add one shot per cube, and you have a cocktail. Contrary to what you might expect, Herb and Lou aren't the founders of the company. Herb is the name of the founder of the company's grandfather, and Lou is Herb's friend and fellow cocktail creator. According to the company's site, because Herb and Lou preferred to spend their time at the party, well, partying rather than mixing drinks, they prepared the ingredients of their cocktails beforehand in ice cube trays and froze them. Herb and Lou's cocktail recipes were later discovered in a safe in Herb's basement. The ice cubes come in three varieties: the Clyde, which includes peach and Bénédictine flavors; the Cecile, which includes cucumber and watermelon flavors; and the Cooper, which includes Blood orange and ginger flavors. 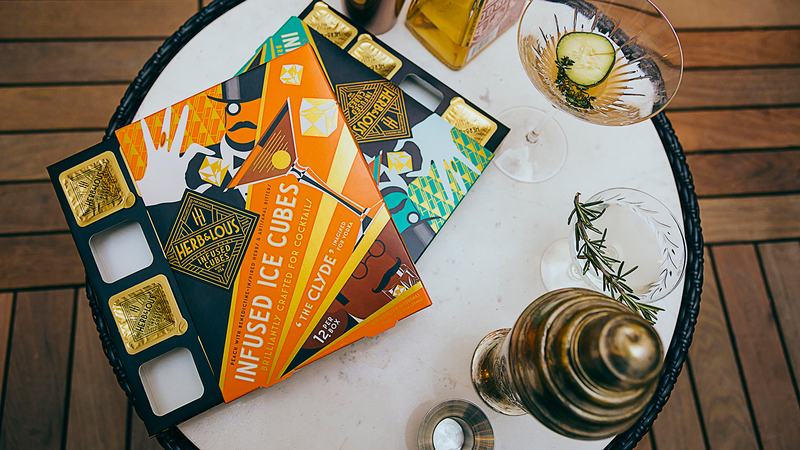 You can buy Herb & Lou's ice cubes on their site or at one of their retailers. Depending on your tolerance for this kind of thing, you might think Herb & Lou's takes it a little too far with the sentimental origins. The fact that all the graphic design—both of the site and the cubes' packaging—is totally prohibition-ed out is only the beginning. All three varieties of cube are named after someone in Herb & Lou's life, and the descriptions are paired with anecdotes about that person. For example, the description of the Cecile includes, "With her electric smile and bohemian air, we suspect (but can't confirm) that Herb & Lou both had a bit of a crush on Cecile – just don't tell our grandmothers." Regardless of whether or not these recipes have a story to tell, you'll be able to squeeze in a little more cocktail chatter at your next party if all you have to do is plop a few cubes into your glass and skip all the mixology.